English Cities Fund (ECf) – a joint venture between Muse Developments, Legal & General Property and the Homes and Communities agency – is developing the wider Salford Central Scheme, which Vimto Gardens is at the core of. Once complete, it has the potential to deliver 11,000 new jobs, 220,000 square metres of commercial space for office, retail and leisure development, 849 new homes, 390 hotel rooms and a number of safe and accessible public areas for local people to enjoy. The objective of Vimto Gardens was to position and develop a name and brand for the residential development that would breathe new life into Chapel Street, whilst staying true to the nostalgic heritage and preserved atmosphere of the historical area. The aim was not only to sell new homes but also a new lifestyle for those who appreciate culture and history. 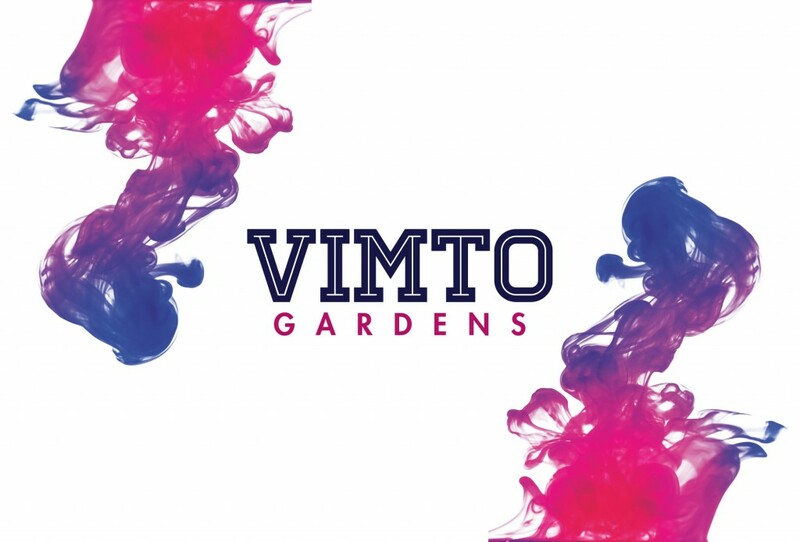 The name ‘Vimto Gardens’ was inspired by the heritage of the local area where the Vimto drink was first manufactured in 1908. The theme was influenced by the original branding for the quintessential cordial in the early 1900s. Many iconic stories and events took place or drew inspiration from Chapel Street, we aimed to unearth some of these with Vimto Gardens to instill authenticity. On completion of the brand identity, the campaign planning and communications strategy followed with full design, production and implementation across website, brochures, hoardings and promotional material. 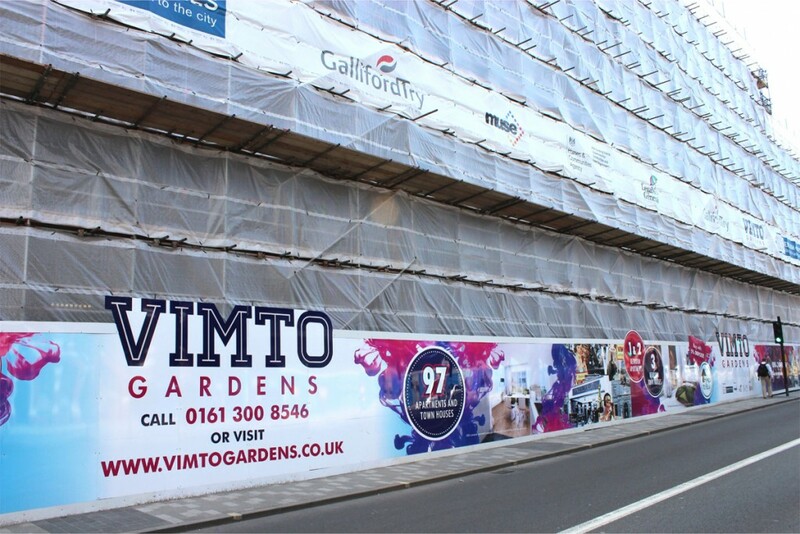 The first look of Vimto Gardens branding was on the hoardings, where we created a vibrant and eye catching outdoor campaign. This became the basis for the innovative branding that has been used throughout the campaign. Working closely with the interior designers and architects we built a hub of excitement, thus creating a youthful and contemporary look and feel. The sales office is the perfect accompaniment to the hoardings, providing potential buyers with a preview of what the homes will look like, and prompting a buzz around the development. Additionally Cuckoo designed a graphic timeline depicted on the walls of the sales office detailing the history of Chapel Street, which has gained a great deal of praise. Brochures, collateral and press inserts also adopted the vibrant and distinctive vibe. 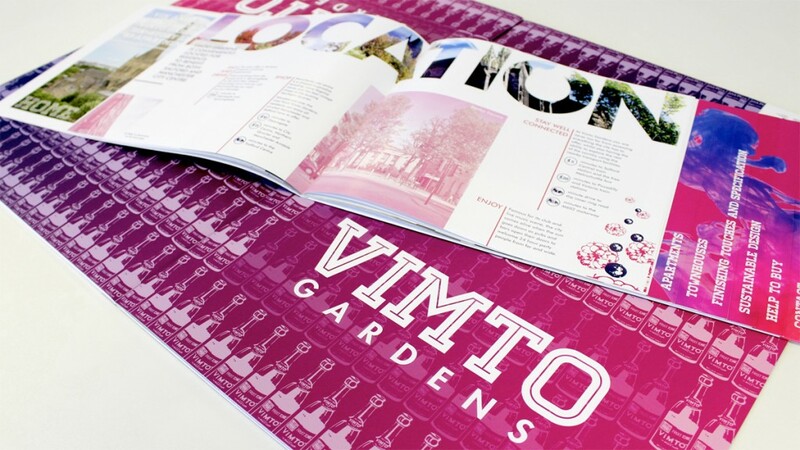 The unique branding aimed to set Vimto Gardens aside from all other residential developments and attract attention from people who wouldn’t normally consider Chapel Street as a place to live. 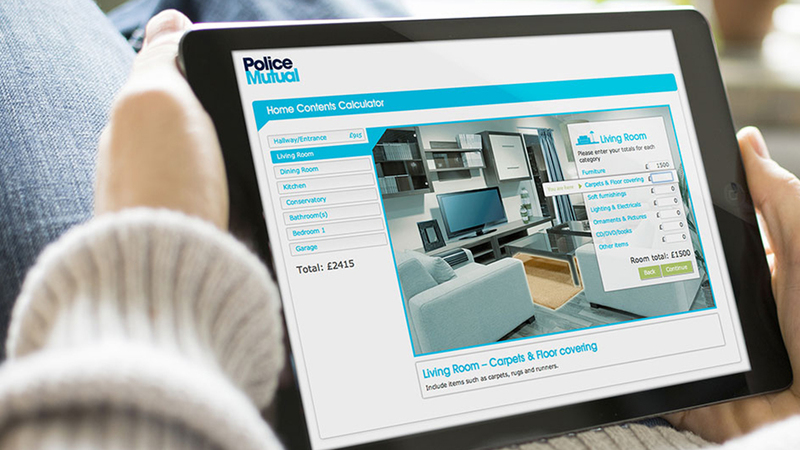 In addition to the offline activity we built an interactive website, with an animated GIF on the homepage showing an artistic impression of how the finished development will look, as well as an email campaign with promotional messaging and updates on the build. 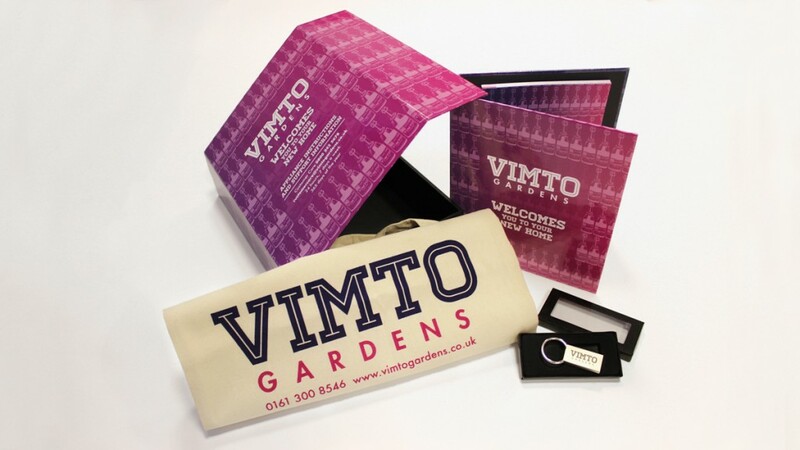 The Vimto branding has been rolled out across additional aspects including gardens and interior i.e. lavender plants and zesty purple deck chairs in the gardens and Vimto purple front doors in the interior. On launching the development a garden party was hosted at the sales office to increase sales and footfall. The highly recognisable Vimto branding was implemented throughout the event with bespoke Vimto cocktails, canapés and Vimto sweets and goodies. To ensure the buyer’s journey was exceptional we designed a vibrant welcome box for the buyers to receive in their new home, which included; a branded keyring, printed folder and a canvas shopping bag. Vimto Gardens was an extremely successful project with 11 properties sold in the opening weekend of sales, all properties amounting to 97 sold in total in just under 10 months. The campaign stood out from all other developments in the area and was received extremely well.